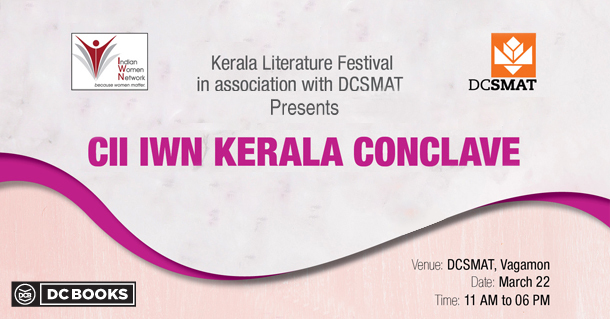 The CII IWN Kerala Conclave will be held in association with Kerala Literature Fest and DCSMAT will be conducted on the 22nd of March, at the DC School of Management and Technology, Vagamon. Reflecting this year’s theme, Balance for Better, the event will walk us through a rich diversity of themes pertaining to leadership, entrepreneurship, social corporate responsibility and talks on work-life balance. The speakers for this event include Ms. Shalini Warrier, Chairwoman IWN, and COO Federal Bank, Sheela Kochouseph Chittilappilly, the Managing Director, V-star, Ms. Sivapriya Balagopal the Vice chairwoman of IWN Kerala, Ms. Meera Haridas, the Vice President of Ayurvaid Hospitals, Dr. Anupama R, Director of Pran Fertility and Well Woman Centre and Ms. Nelbymol Nelson, Company Secretary, Terumopenpol. This conclave aims to spotlight women’s economic empowerment, demystifying entrepreneurship with their success stories bringing in a flavor of relatability and closeness to what might seem unattainable and distant.